On Friday 21 October, The Cutting Garden is going totally pink. If you join us on Friday you could help wipe out breast cancer and win yourself a sweet Limited Edition GHD at the same time. Every year we are proud to take part in Breast Cancer Awareness Month, which is a worldwide campaign to highlight the importance of breast awareness, education and research with our Wear it Pink Day. This year, we’re determined to make it even more successful than ever. Wear it Pink Day is Breast Cancer Now’s flagship fundraising event. Breast Cancer Now is the UK’s largest charity for breast cancer. We always take part in Wear it Pink Day because it’s the best way we know to combine fun and style with such an important cause. Nearly everyone in the UK has been affected by breast cancer. Whether it’s a relative or a friend of a friend this is an issue that touches us all in some way. Nearly 60,000 women are diagnosed with breast cancer each year in the UK. Shockingly, that’s the equivalent of one person every 10 minutes. Breast cancer is the most commonly diagnosed cancer in women in the UK. One in eight women in the UK will develop breast cancer at some point in their lifetime. Neither is it something that only affects women. Around 340 men are diagnosed with breast cancer every year in the UK. Almost 12,000 people die from breast cancer in the UK every year. We want to do something about that, which is why we love running our special Wear it Pink Day event at The Cutting Garden every year. We are inviting you to join us this year to help us raise a record amount for this fantastic cause. Join the Party and Win! The only thing better than a party is a party with prizes so, to make it even better than ever, we are running a Prize Draw with some incredible prizes. How would you like to win a beautiful set of Limited Edition GHDs? How about some GHDs that are so hard to get hold of that your friends will bow down before you just to see them? We have managed to score a set of the amazing V Gold Copper Limited Edition Christmas GHD worth a cool £150 which will go to one lucky winner of our Wear it Pink Prize Draw on Friday. But that’s not all. From the moment when we open our doors at 9.00am until we close at 6.30pm The Cutting Garden is going to be partying in pink. 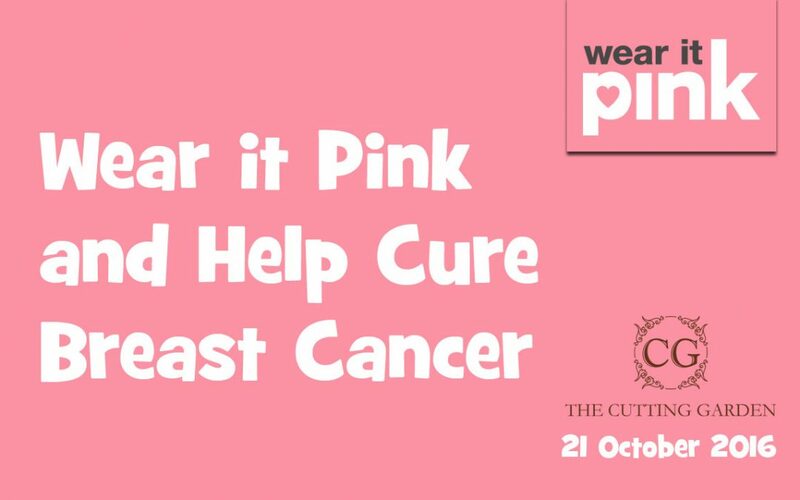 Our stylists will be sporting their most fetching pink outfits and if you want to join in too we’d love it. Gents, how about a pink shirt, tie or socks? Ladies, can we tempt you to try adding a pink tint on the day? We’ll be serving pink lemonade and having a cake sale, with all proceeds going to Breast Cancer Now. If you have a sweet tooth, you could win a massive jar of sweets by guessing how many are in the jar. 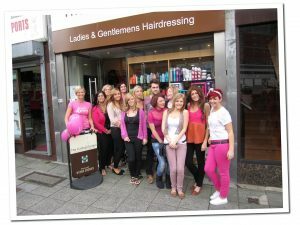 Even if you weren’t planning to get your hair done, please pop in to help support us in our fight to end breast cancer. Keep an eye on our social media channels for more news of what’s happening during the day too. In addition to all of that, 5% of the cost of any products you buy on Wear it Pink Day will go straight to the charity, so if you need anything at all, drop in and see us. Breast cancer is such a terrible illness that can devastate lives, but we can beat it together. So this Friday, come to The Cutting Garden and get your pink on to help us cure breast cancer together.